It’s been a while since my last Tuesdays with Dorie post! I’ve missed that group! Trying to get back into the swing of things, I made Dorie Greenspan’s recipe for a Pear Tart with Crunch Almond Topping from Baking Chez Moi. This Pear Tart recipe wasn’t too difficult to put together. There were only three components: the tart crust, the pear filling, and the almond topping. I had no idea what kind of pears to use, but I ended up using Bartlett pears because they were on sale at the grocery store! The first step was really making a sweet tart crust. This is my favorite crust because it actually has really good sweet and buttery flavor to it! The second step was making the crunchy almond topping. This step was pretty easy because was just mixing powdered sugar with egg whites, and then adding sliced almonds to the mix. In the end, the topping looked pretty gross. You can’t tell from the photo below, but it was pretty slimy. Spoiler Alert: in the end, this is a real highlight of the tart! Dicing the pears was the most time-consuming part of this tart. I had a ruler and made sure that each pear cube was 1/2 inch. It took me over an hour to cut up 5 pears! Well, that’s not what really happened, but it felt like it took an eternity to finish! I actually did measure the first pear cube I cut, though (but only as a visual reference of what 1/2″ looked like). The pears went onto the stove to cook with some butter, sugar, and bourbon (the alcohol burned off). The three components were finally ready to go! The pears and its juices fit perfectly into the sweet tart crust. The slimy almonds went on top of the pears. 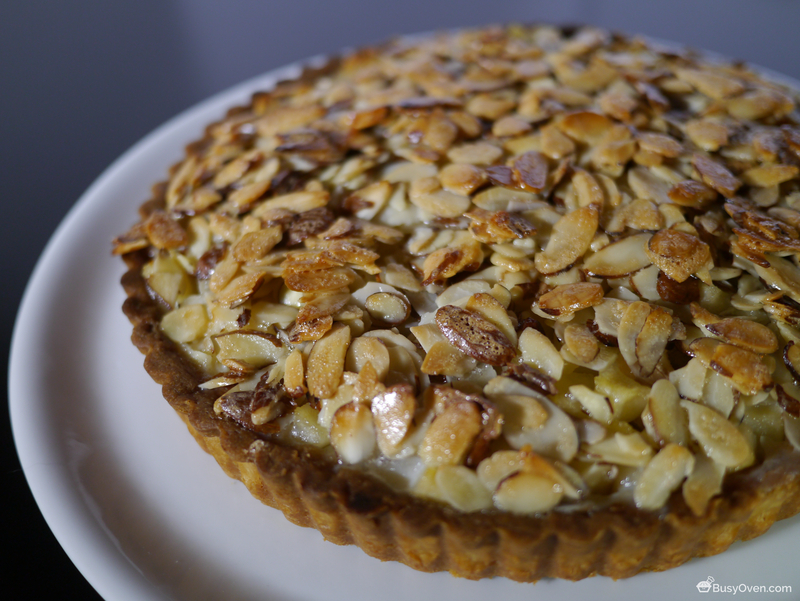 It’s amazing how much almonds can dress a tart up! The tart baked for about 20 minutes, until the almonds got golden brown and shiny. The slimy almonds turned nice and crispy. It turned out to be my favorite part of the tart! Dorie said to sprinkle the tart with confectioner’s sugar, but I thought it looked really good without it. I’m terrible at cutting pies, tarts, and cakes. I was especially nervous about cutting this tart because I was afraid that the pear filling would come falling out. Surprisingly, I managed to cut a slice without destroying it! I would make this recipe again. Aside from cutting the pears, it came together pretty quickly. The tart tasted great, especially when it was still warm! I had another slice for breakfast the next day (it re-heated nicely in my toaster oven). The recipe for this Pear Tart with Crunchy Almond Topping can be found here. Pear Tart with Crunchy Almond Topping is on page 127 of Baking Chez Moi by Dorie Greenspan. Your tart looks great! I had a slice of it for breakfast too. I’m going to have to find an occasion to bake this. It looks so wonderful! I did make the apple squares this week and they are so good. Glad to know it wasn’t just me who disappeared for a bit. But glad you’re back with us now! And your tart looks gorg! No idea how you had the patience to cut those pears into such specifically sized pieces, but it did turn out wonderfully!